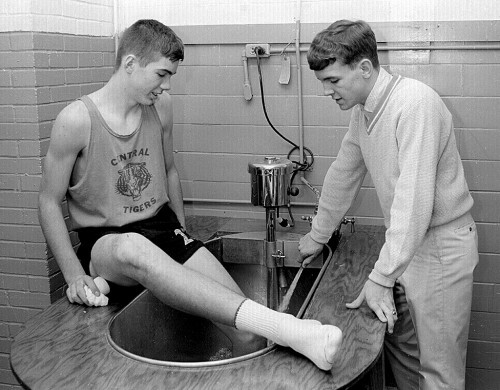 The 1966 Girardot said Terry Crass had been manager of the football, basketball and track teams. He also served on the student council, was treasurer of his homeroom, was in the Thanksgiving play, was a member of the Varsity club and was selected as an Outstanding Senior. Who is he working on? The fellow looks too short to be a basketball player and too light for football, so I’m going to guess he was on the track team. Of course, players in those days weren’t the monsters they field in high school days, so my suppositions could be wrong. And furthermore, Terry Crass is class act. I remember Terry and John Young helped keep us all in one piece at one time or another. Larry Johnson was pretty good Basketball and Baseball player too and nice guy. TerryCrass still is is the wonder man he was in HS only more so. I just read in paper that his beloved mother had passed away. I reached out to give him my condolences. Terry is a supervising nurse at the Veterans Clinic here inCape so I see him routinely in that capacity and we talk by phone and email more often. He literally has changed very little since the photos from 66. Still trim and vigorous with endless energy and compassion. Recently retired from the army reserves Lt. Colonel Crass served with courage and distinction on a tour in Iraq during the highth of the war there. We corresponded frequently during those long months he served there and he never ceased to amaze me with his courage, commitment, and never die upbeat attitude about the good they were accomplishing there. . Though trained to command a medical MASH unit he was utilized in other duties because of his multitude of communication and orgainizational skills. His unit was repeatedly caravaned through the tretchurous streets of Iraq deep into unsecured areas of the city’s to work with locals in reestablishing medical care plus local utilities , electricity, water , and government. Heavily armed special forces were required to accompany and protect his unit as they worked with the local Iraqi community leaders. You can only try to imagine the dangerous tense situations he worked in daily with the mayham and confrontation with insergents all around him. After returning to the states safely he lobbied to return for a second tour but because of age and nearing retirement his requests were denied. Though I don’t spend as much time with Terry Crass as I could or should – I still consider him one of my oldest and truest friends and he will always and for ever be one of my hero’s. though its comon knowledge about my declining faculties and suspect memory – I’m very certain that – on the above – I am quite sure. LTC Terry – Bravo Zulu! Terry spent two tours in Iraq while in the Army Reserve. He also spent a tour of duty in Vietnam as a Navy corpsman. He is very involved in Veterans Affairs now. Terry is an all around nice guy and is very patriotic I am honored to call him a friend. If I remember correctly – these photos were staged for the photographer (? ).… Being the conscientious and modest person he was, Terry really didn’t want the attention. I haven’t seen him in many years but get updates from my Dad who sees him at the Veteran’s clinic regularly. I love the old photo, but particularly enjoy the wonderful updates on the activities of Terry Crass. Good for him! After reading Terry’s accomplishments as an Army officer, I am convinced the Army should have made him a General. The Crass family lived just down the hill from our family when we were growing up. Many hours were spent with Terry and his sister, Carolyn, Brenda Jean Barks, my brother, Kenny, and I playing baseball(our version with the bases being a big concrete block to sit on, a birdbath, and a clotheline post), hide-and-seek, and whatever other childhood games. We even had a neighborhood yell (Ee-ah-kee!!!) that we would do when one of us came outside and wanted the others to join us. In those days the windows and doors were always open in the summertime because no one had air-conditioning, so it was easy to hear our yells. The Crass/Slinkard families were close due to our fathers coming from the same “neck of the woods” and having music in common. Bill, like Terry, played trumpet and Daddy played his sax. Our families spent many nights waiting for the guys to come back from their gigs. I’ve always been proud to call Terry a friend. Hey Kathy, this is Jill Haney, daughter of Joy Haney. Do you remember meeting me with my mom I’m Branson when you had the Elvis musuem there? I’ve been thinking about you wondering if you and your kids are ok and where you’re living now. If you want, you can contact me at pocotara51765@yahoo.com. Hope all is well. I to know Lt. Col. Terry Crass. Col. Crass is the backbone of the Cape Girardeau Community-Based Outpatient Clinic, without him covering our back at home (at the clinic) I surly would be in very bad shape without him. There was not one time when I was hurting that I could call on Col. Crass that he would call me into his office and offer medical treatment no matter how busy he was, for HIM people CAME first. I too remember when Col. Crass went to Iraq he was sorely missed at the clinic but he came back stronger and more knowledgeable on how to run a VA Clinic and treat hurting veterans. This man has dedicated his whole life to our country and I salute him. I am a disabled combat veteran (3/1 Cav. Division) and he has all the bravery of any man I served with.